Simple and effective way to learn how to book your own loads. Finding freight and generating a profitable revenue! Tools you need to dispatch yourself even from your truck! How to develop relationships and offer great service as you grow in the trucking industry as a carrier or a dispatch service. It all starts from understanding what the spot market is and how it works! Increase your revenue or learn how to book your own loads starting today! Little book to turn your vision towards the big picture! Don't spend your money on "dispatch courses" which can cost hundreds of dollars. Buy this book for $49.99 and I will include personal one on one help for you to learn and achieve your goal for free. Before I can do that, you need to understand this book. You can also join our forum for FREE for more information on finding your own loads! This book gave me confidence to finally start - perfect for beginners. The ultimate guide to traveling. I read the whole book last night - I liked it a lot! You will learn where and how to book freight in the spot market. Most important lesson that you will learn is how to know if the freight that you book is creating a profit for you! This book will also teach you how to offer outstanding transportation services and how to develop relationships with freight brokers! Understand how spot market was started. Every company uses the spot market. Learn where the best freight is being offered and how to obtain it! This is what your dispatcher uses 99% of the time! Understanding how to calculate your operating cost as a business and what rates you will need to achieve to generate a high profit based on your operating costs! A $3,000 weekly settlement can rise to a minimum $4,000 weekly settlement as soon as you understand your operating costs and stop leaving money on the dock wrapped in plastic on pallets! Little things can mean a lot. Simple service skills can award you more than you know! Find out how to achieve them all from a simple email that you send! Below I have took out a few segments from the book! There is a lot more on this subject to help you understand. The sooner you understand the sooner you will be generating more income! "As the quantity of products grew for the growth of population, the number of shippers grew as business expanded, and the demand for more trucks and drivers grew. Currently mega carriers are not able to supply so many customers, therefore independent carriers, and smaller carriers transport the majority of the products across the country." What Is A Good Rate Per Mile? "..Soon as you figure out your cost per mile or your owner operators cost per mile, you will know what is a good rate per mile. ​Most people leave money on the docks because they scream “cheap freight” but they don’t understand to them that cheap freight might have been a profit. " Where Do I Start Finding Loads? "Chances are you are running in the spot market through a carrier you are already leased to. They are booking the same loads that you can, without them taking a cut of the money, or offering you only what they think is good for you. Also they will look for the best paying loads for their OWN trucks before they bother to find you the best paying load. It makes sense." "You're on the road, you are away from an office. Here is the tools that you will need..."
First I gave one on one lessons to dozens of people to ensure they can make a profit in the trucking industry. Writing a simple yet effective book taught a lot more than my one on one teachings! First 100 books were given to my friends in this industry to make sure this book worked, and now I'm offering it to anyone in the trucking industry. At first it was a joke to me. I drove for more than 5 years using dispatching services and I can't say they were bad. But I always wanted to book my own loads and the internet didn't have information I needed. I bought this book in person from the author at a truck stop and it took me two weeks to learn what I am doing. I went from making $2.800 a week give or take clean to making over $3,500 just by understanding what makes me a profit and what to book myself! Wish I had this book years ago! Would give it a 5 star rating but I needed some one on one help since there were things I didn't understand but the author worked with me one on one until I understood! Thank you! Loved It! I got tired of being force dispatched or sitting all day waiting for a load. I got this book as a gift from my wife. Normally I hate reading but this book was simple and easy to understand. It made me want to get my own authority. I contacted the author of this book and he helped me with every step I needed. Now I make way more money and have more home time. Anytime I don't feel like I'm reaching my goals I read this book over and start with a clear mind. I highly recommend it to anyone in this industry! Wonderful short book. My husband has been an owner operator with his own authority but got injured and had to spend time in the hospital. I didn't know what to do while waiting for his health to get better because my 9-5 job couldn't cover bills, I felt nervous. I found a driver on craigslist but I didn't know how to find loads. I found this book through internet searching and made the best profitable decisions I could. Now we have our own little fleet and hope to grow more. If it wasn't for this book I don't know if we would have been part of this industry anymore. This book got my kudos! Just wish it was longer since I love to read. Worth every cent. My brother Rob got into truck driving. He always wanted to open his own trucking company. He always kept pushing me into pursuing it with him. I wasn't sure what to do in the office to find loads for him. I got this book and now we are a independent carrier with a fleet of 12 trucks. This book gave us all the basics we needed to understand what makes us a profit and what doesn't. Worst part was not knowing where to find freight, and now the worst part is how do we attract more drivers. Great book! 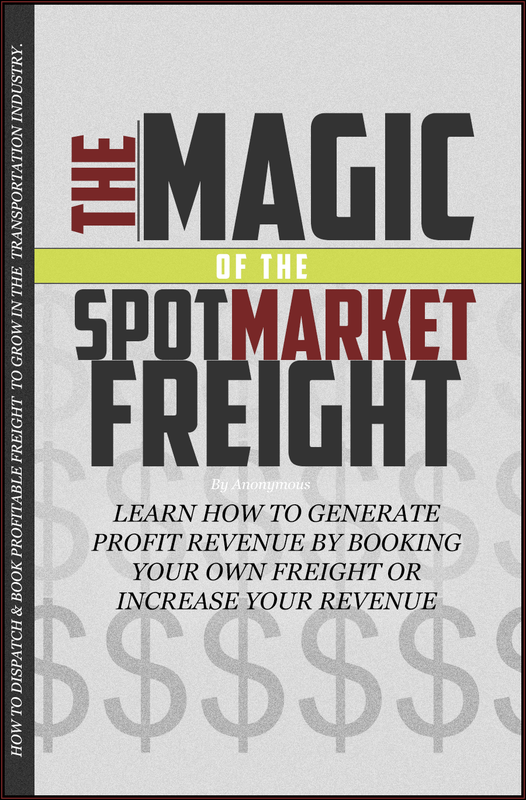 Purchase my easy to read simple and effective book to gain the most profit as you book your own freight in the spot market! Thank you for checking out The Magic Of The Spot Market Freight and I hope you become a spot market freight master!